Does anyone know if Sylvester Stallone is going to make the remake of the movie? Dear Robertik, we love you! Can you please amend the title of your thread to Musa Ler? As we speak there is no such thing as Musa D**h. Even those SSOs** call it Saman D**h.
To us it has been and will always be Musa(neri) Ler. Even though many of us may know that goddam language, we prefer to not use it. Franz Werfel was not Armenian, he did not know the difference of the furkish d**h and the Armeian LER. What is our Excuse??? We still remember when you came here with a furkish nickname, thank you for amending it. And, please, please, if and when that Italian Stallion decides to follow suit, urge him to use MUSA LER as his title. ** SSO stands for "sun-shan-ordi"
Edited by Arpa, 31 May 2008 - 09:55 AM. As we speak there is no such thing as Musa D**h. Even those SSOs call it Saman D**h.
btw, how would you edit? I could this edit this now, but that first post was posted some time ago. Edited by robertik1, 31 May 2008 - 10:00 AM. Yes, we know. Did Franz speak Armenian? Those SSOs call Masis "aghri". Shall we amend our language here too? Ok, how do you do it? Bring up your post. Go to edit, and... good luck. Otherwise let our mods do it. And please, please forget that goddam language. Learn to speak Armenian. We speak Armenian here! Mountain is LER not (MUSA) qaq-d**h! We don't allow to describe that murdere talaat qaqa as p*s*a, and Artsakh as kara***qaqa here, why should we allow (Musa) qaq-d*g*? Do we know Armenian? Do we know that the Armenian word for mountain is LER/SAR? When did Franz Werfel, the Austrian-German Jew, as sincere a he may have been become an Armenian linguist? Can we teach him how to speak Armenian? Hopefully, some day our mods and ads see it fit that that goddam D*** word never displays again, perhaps replace it it with LER??!! Just as they have placed filters to never display talat qaqa or kara-qaq= Artsakh. Please eveyone! Don't use that cursed D word. We have more words than that drunken idiot Noah** to deascribe mountain, words like LER and SAR. ** Does any one know that the Bible never said Mountain (singular) of Ararat, but the plural thereof as MounainS of Ararat, i.e the Land of the Araratians? If only we, and those illitero-biblio-fundamentaist idiots would learn how to read!! Edited by Arpa, 31 May 2008 - 12:21 PM. Its ok, did mods did it. Ok getting back the original topic, is Stallone going to make the remake or not? I hope so. We should petition. I'm curious, how did Stallone's interest pique in the Armenian Genocide. I know that for years, we've been lobbying for the biggest genocide director (Stevie) but he's never commented about it. In fact, I think he just made a new film or is in the middle of making one about Ukrainian Jews in occupied USSR. new light on the many facets of this extraordinarily complex figure. to place, Werfel often asked himself where his "homeland" really was. Bernadette (1941), featuring the young girl and her vision at Lourdes. "betrayal," his wife, Alma Mahler, pressured him to renounce Judaism. Armenians massacred by the Turks, and that no one was caring for them. ensued was treated by several speakers in Potsdam. Bagradian), the former military officer who led the resistance. corresponds to reality, as recorded by Lepsius himself in his report. The rest, as Prof. Martin Tamke from Gottingen detailed, was fiction. write an eyewitness report but poetry, a work of art. him with valuable source material. from Catholicism to the Apostolic Church. represents a complete and accurate rendition of the German original. expelled from a writers' association, and his novel publicly burned. organizations issued black lists of publications considered "damaging"
it would be confiscated and the owners put under pressure. insistent, heavy-handed intimidation by Turkish authorities. As Dr.
"Franz Werfel" committee also participated in the organization. related to the heroic Resistance of Musa Dagh. was presented to the audience. whose most acclaimed work, the 1933 "The Forty Days of Musa Dagh,"
1915 campaign against the Armenians. one of the first books consigned to the bonfires by the Nazis. Franz Werfel died on August 26, 1945, at the age of 54.
respectable age, has overcome a serious surgery, which was successful. recovery and for the return home. Arshavir Atajyan to Armenpress correspondent. the project is dedicated to the story of 101-year old Silvard Atajyan. Days of Musa Dagh" by Austrian author Franz Werfel. to throw back the attacks of the Turkish troops 53 days. ordered the mother to take us and climb up the mountain." After the 53 days of resistance the family reached Egypt due to a French vessel. husbands and the other part supplied food and arms to the fighters. of resistance the family reached Egypt due to a French vessel. later, in 1947 - to Yerevan. blessed by a priest and necessarily from sacrificed lamb meat. that according to the forecast, she will live for 5 years more. She is fond of the flowers, which she has planted and cares with her own hands. the care of which she does not trust anybody. Today Silvard has 3 sons, one daughter, 7 grandchildren, and 12 great grandsons. were Haji Habibli, Yoghunoluk, and Kabusiye. European notions of human rights. Revolutionary societies penetrated Musa Dagh beginning in the 1890s. to the SDHP, were indoctrinated, and underwent some military training. ruffians from assailing Musa Dagh. covered this heroic saga with editorials, articles, and pictures. Greater Syria as well as Cilicia. legislatures, with the latter party succeeding to a larger extent. showcased in recent years as the only Armenian village left in Turkey. population resettled in Soviet Armenia. an edifice likewise attracts celebrants each September. Genocide, challenges remain. How to preserve Musa Daghtsi identity? Soldiers are trained to do one thing above all else: follow orders. the consequences could be should he take matters into his own hands. and were eventually killed during death marches to Syrian deserts. few weapons. But they were determined and well disciplined. around the flags, hoping to draw attention. the French command. The French left with a promise to bring relief. was once again promised that French navy would help. cruisers at his disposal to Musa Dagh to begin evacuations immediately. command] told us, it was necessary to evacuate all of them." camp in Port Said, Egypt, without the consent of his senior command. were evaculated, then the armed forces. children, several of whom had been born during the operation itself. cruiser whose crew had noticed the signal from Musa Dagh. healthcare and schooling, as Dartige had arranged. not a single refugee would have survived. and discovered the location of his hometown, as well as his tomb. depicting the one waved by the freedom fighters was placed on the tomb. French paying homage to the man who risked so much and saved so many. of them to the Treblinka killing center to be gassed. other cultural materials in collective acts of spiritual resistance. Forty Days of Musa Dagh, by Austrian-Czech writer Franz Werfel. for all mankind, and hostility to extreme nationalism and Nazism. 1915-16–a series of actions we now call the Armenian Genocide. Europe, except in Nazi Germany where it was soon banned. Warsaw Ghetto also drew strength from the struggle at Musa Dagh. annihilation of the Armenians and saw themselves. stories about Ottoman attacks, including startling death tolls. the atrocities that rallied their great-grandparents to action? The Armenian Genocide Museum-Institute (AGMI) has discovered 25 never-before-seen photos depicting scenes from the process of evacuating the participants of Musa Dag resistance. Musa Dag was the location of a successful Armenian resistance to the Genocide, an event that inspired Franz Werfel to write the novel The Forty Days of Musa Dagh.Allied warships, most notably the French 3rd squadron in the Mediterranean under command of Louis Dartige du Fournet, sighted the survivors, just as ammunition and food provisions were running out. French and British ships reportedly evacuated 4,200 men, women and children from Musa Dagh to safety in Port Said. The pictures were taken in September 1915 by a French Navy officer. 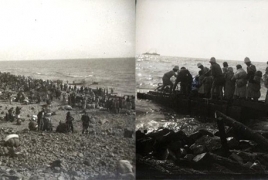 They portray the process of transporting the civilian Armenian population to French warships, the moment of their boarding the vessels and other scenes. The newly-discovered photos will be available to public beginning from April, 2018, AGMI director Hayk Demoyan said. In 1933 Franz Werfel's epic novel "The Forty Days of Musa Dagh" was published to huge acclaim. The story of a guerilla army of Armenian villagers holding out against overwhelming Turkish forces on themountain of Musa Dagh in 1915, before evacuation by French forces to Port Said in Egypt. The mass murder of more than a million Armenians during this period had led to an international outcry during the war and, after 1919, the beginning of a campaign of denial by the Turkish government that succeeded the collapsing Ottoman empire. Germany, former ally of the Ottoman empire, also rejected any guilt by association but the assassination of Talaat Bey, former Ottoman Minister of the Interior and the key architect of the Armenian extermination, who was gunned down in Berlin in 1921 by an Armenian, caused a furore. The subsequent trial became a major media event and exposed the knowledge of the German government about the massacres. The fate of the Armenians was widely discussed and many on the right explicitly linked them with the 'Jewish question' as Hitler rose to power. Franz Werfel, already a famous poet and well-known author, touring the Middle East in 1929 with his new wife, Alma Mahler, encountered pathetic Armenian refugee children. Their plight was the spark for his vast work. For both Werfel and its many readers "The Forty Days of Musa Dagh" was not just an epic tribute to Armenian resistance and survival but a warning. Werfel's works were burned and banned after Anschluss and in 1938 he and Alma Mahler fled to America. Hollywood's attempts to film it soon after publication began a decades-long campaign of long-distance censorship by the Turkish government. Maria Margaronis tells the extraordinary story of an extraordinary book and its impact as Europe descended into barbarism.